The 'Custom UI' option is found in many places where automatically generated controls are found throughout VDMX to edit the layout of the user interface items in the window. In this tutorial we'll focus on using this feature in the 'Control Surface' plugin though the concept is applicable elsewhere, such as the source controls for Quartz Composer patches playing on layers. 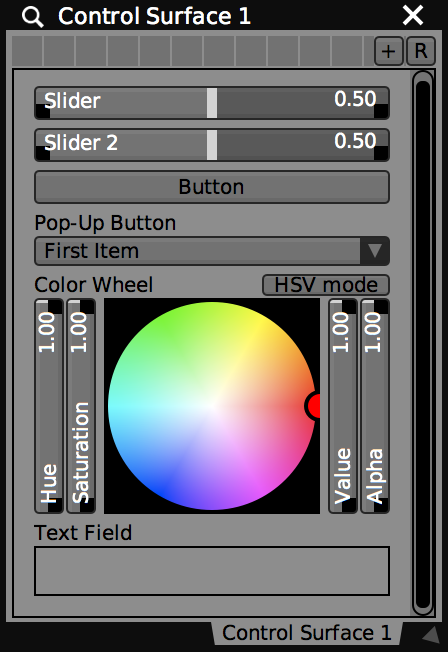 Sliders, buttons, pop-up menus, text fields and color pickers can be added. The 'Custom UI' toggle button switches between automatic and manual UI item layout. The 'Edit UI' toggle button enables the layout editing mode. Use the control handles for the UI items in the Control Surface window to resize and reposition each controller object. The grid size can be adjusted in the inspector. Control Surface with custom UI items. Inspector for Control Surface with Custom UI and Edit UI options enabled. The same control surface in Edit UI mode and a custom layout.